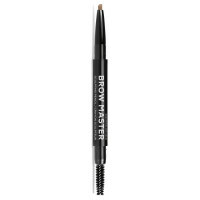 BROW MASTER™ Sculpting Eyebrow Pencil permette di definire e riempire facilmente le sopracciglia donandole un look naturale. I pigmenti minerali donano un colore naturale modulabile pensato per adattarsi al colore dei tuoi capelli. La formula è resistente all'acqua e alle sbavature, rendendo le tue ciglia perfette per tutto il giorno. 0,2 g - Honey Synthetic Fluorphlogopite, Stearic Acid, Triethylhexanoin, Hydrogenated Castor Oil, Synthetic Japan Wax, Beeswax (Cera Alba/Cire D'Abeille), Sorbitan Sesquiisostearate, Tocopherol, Aluminum Hydroxide. May Contain (+/-): Titanium Dioxide (Ci 77891), Iron Oxides (Ci 77491, Ci 77492, Ci 77499). 0,2 g - Chestnut Synthetic Fluorphlogopite, Stearic Acid, Triethylhexanoin, Hydrogenated Castor Oil, Synthetic Japan Wax, Beeswax (Cera Alba/Cire D'Abeille), Sorbitan Sesquiisostearate, Tocopherol, Aluminum Hydroxide. May Contain (+/-): Titanium Dioxide (Ci 77891), Iron Oxides (Ci 77491, Ci 77492, Ci 77499). 0,2 g - Cocoa Synthetic Fluorphlogopite, Stearic Acid, Triethylhexanoin, Hydrogenated Castor Oil, Synthetic Japan Wax, Beeswax (Cera Alba/Cire D'Abeille), Sorbitan Sesquiisostearate, Tocopherol, Aluminum Hydroxide. May Contain (+/-): Titanium Dioxide (Ci 77891), Iron Oxides (Ci 77491, Ci 77492, Ci 77499). 0,2 g - Coffee Synthetic Fluorphlogopite, Stearic Acid, Triethylhexanoin, Hydrogenated Castor Oil, Synthetic Japan Wax, Beeswax (Cera Alba/Cire D'Abeille), Sorbitan Sesquiisostearate, Tocopherol, Aluminum Hydroxide. May Contain (+/-): Titanium Dioxide (Ci 77891), Iron Oxides (Ci 77491, Ci 77492, Ci 77499).